Four alleged members of Hizb ut-Tahrir plead guilty to terrorism | Russian Legal Information Agency (RAPSI). ST. PETERSBURG, July 16 (RAPSI, Mikhail Telekhov) – Four alleged members of the St. Petersburg cell of Hizb ut-Tahrir terrorist group banned in Russia have pleaded guilty to terrorist activity, RAPSI reports Monday from the Moscow District Military Court’s offsite hearing held in the Leningrad District Military Court. In total, there are eight defendants, who stand charged with participation in the activities of a terrorist organization, including citizens of Russia and Tajikistan. According to case papers, starting November 2013, the Hizb ut-Tahrir cell has been operating in the Leningrad Region and St. Petersburg. Russian citizens Maksim Tsvetkov, Aziz Yusufov, Artur Akhmedov, Islam Akhmedov and Eldar Mamedov were arrested in November 2016. Tajik national Farkhod Nurmatov was arrested in January 2017. Two more defendants, Mirzobarat Mirzosharipov and Magomed Akhimov were arrested in June 2017. During searches at their apartment law enforcement officers seized data storage device, books and magazines containing terrorist ideology. Islam Akhmedov, Mamedov, Yusufov and Nurmatov have pleaded guilty. In May 2014, the Federal Security Service opened several criminal cases on organization of the St. Petersburg cell of Hizb ut-Tahrir and participation in the terrorist group. Over 30 people were arrested at that time and 9 of them were detained. In 2015, the Moscow District Military Court sentenced two defendants, who pleaded guilty, Gapur Magomedov and Makhamadin Saliyev to 5 years in prison each. In March 2016, the cell leaders Roman Ivanov and Sergey Yablokov received 13.5 and 12.5 years in prison respectively. In August 2016, Karim Ibragimov, Eldar Ramazanov and Ilyas Kagirov were given 17, 16 and 5 years in prison respectively. In November 2016, the court sentenced two more defendants, Dmitry Mikhailov and Isa Ragimov, to 16 and 12 years in prison. Arrests continued after their sentencing. 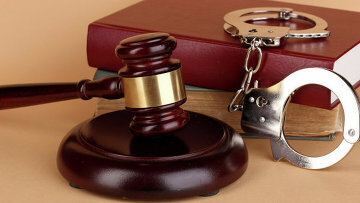 In March, the court sentenced Leningrad Region’s resident Vladimir Shmotov to 8 years in prison. The man pleaded guilty to participation in the terrorist group. Moreover, Yablokov’s mother and alleged leader of a women’s cell of Hizb ut-Tahrir terrorist group Alla Bespalova is currently in detention. Hizb ut-Tahrir (the Party of Islamic Liberation), founded in Jerusalem in 1953, is banned in several Arab and Central Asian countries. Russia's Supreme Court banned the group from operating on the territory of the country in 2003, describing it as a terrorist organization. Hizb ut-Tahrir members are regularly arrested by the police across Russia, mainly in big cities in central Russia, the Volga region and Siberia. Also, there are many supporters in Crimea, which rejoined Russia in the spring of 2014.